A Chinese lawyer detained by police last month for representing Christian churches whose crosses were taken down by the local authorities in the eastern China province of Zhejiang has been recently accused of spying. 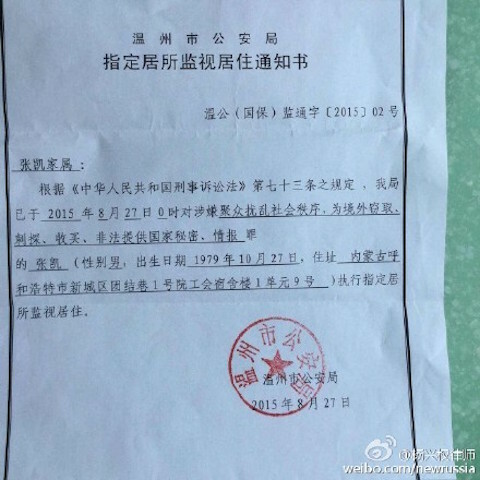 On Sept. 3, the family of human rights attorney Zhang Kai received a notice from public security officials in the Zhejiang city of Wenzhou informing them that he was being placed “under surveillance” on suspicion of “gathering and disturbing social order” and “stealing, spying, buying, and illegally providing state secrets and intelligence to entities outside of China.” Yang Xingquan, the director of the Beijing law firm Zhang worked for, posted a picture of the notice on Sina Weibo, a Chinese microblogging service. 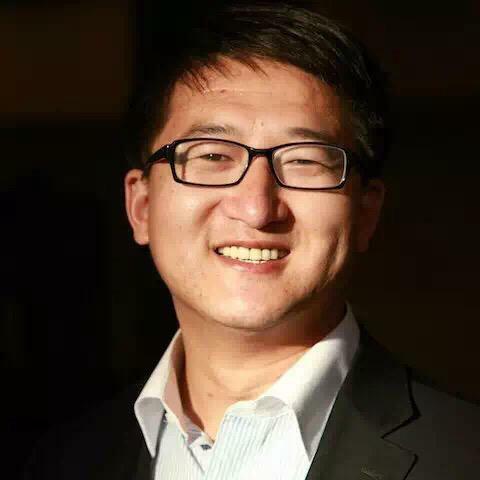 Zhang, 36, and his assistant Liu Peng were taken into police custody on Aug. 25 after spending two weeks in Wenzhou providing legal advice to churches affected by an early July ruling by Zhejiang Communist Party officials that forces them to remove crosses from church buildings. It is unclear where the two are being currently being held. Zhang Kai is the latest Chinese attorney to be targeted in a massive crackdown on rights defense lawyers that started in July. Over 280 rights defense lawyers and activists have since been questioned, detained, or had their movements restricted, according to China Human Rights Lawyers Concern Group, a Hong Kong-based nonprofit. Rights defense lawyers attempt to represent the disenfranchised in Chinese society using the legal system set up by the Communist Party, which it claims protects the rights of all Chinese citizens. Oftentimes these lawyers are denied access to their clients, and in extreme cases, manhandled and thrown forcibly out of courtrooms. On Sept. 1, David Saperstein, the U.S. ambassador at-large for religious freedom, said that the detentions of Zhang Kai and others persons whom he was due to meet during his visit to China in late August to assess religious freedom in the country were a “particularly alarming development,” according to the Associated Press. “In that context, there can be no excuse for the detention of these religious figures who either met with me or tried to meet with me,” Saperstein told reporters in a conference call. He also called on the Chinese authorities to release the detainees. According to Chinese criminal law, if Zhang is found guilty of passing on state secrets—a serious criminal allegation—he faces a minimum of 5 years in prison, or in the most severe case, the death sentence. Chinese netizens too expressed disbelief. “Incriminating people with fabricated crimes—the usual technique,” read one comment on Weibo. Unlike in most Western democracies where state secrets are limited to information pertaining to national security, intelligence, and the military, the Chinese regime defines state secrets in the loosest of terms. Teng Biao, one of China’s most outstanding rights defense lawyers who is now a visiting scholar at Harvard University, told an Epoch Times reporter in a telephone interview that the charge of “providing state secrets” is in the past commonly leveled against journalists, lawyers, and writers in China. For example, Shanghai-based rights lawyer Zheng Enchong was accused of “providing state secrets to entities outside of China” after he allegedly sent a report on a mass workers’ protest in Shanghai to a human rights group in New York in 2003. Zheng was later convicted in a Chinese court, and jailed for three years. In April this year, veteran Chinese journalist Gao Yu was sentenced to seven years in jail for allegedly leaking a Communist Party memo whose information was already publicly available on government websites. In fact, the Chinese authorities “taking action against him for his rights defense activities is a form of persecution,” Teng concludes. Veteran journalist and Communist Party critic Gao Yu is given a 7-year jail term for leaking state secrets. A former top-ranked Chinese official and a journalist were charged with leaking state secrets, a problematic legal term under the Chinese regime. In a coordinated campaign over the last few days, Chinese communist security forces have taken into custody around fifty prominent lawyers. 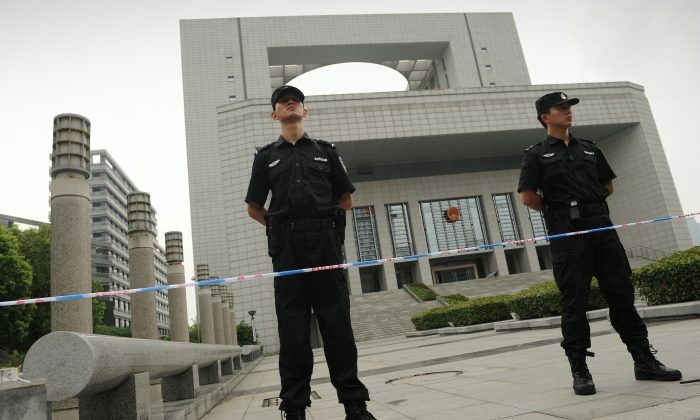 Wang Yu was “destroying court order,” said CCTV. But the facts tell a different story.